Life in the north changes your perspective and you learn not to take things for granted. Even one’s expectations of seasonal changes fall by the wayside. Autumn is a very short season in Yellowknife, essentially a big tease. It officially began on September 22nd like everywhere else, but it ended on October 15th, when about 6 inches of snow blanketed us. Up here the trees are mostly conifers, so while some of them do turn yellow, absent is the sound of leaves crunching underfoot that is common at this time of year “down south”. (In Ontario, people say “down south” to refer to Florida, Mexico or the Caribbean, but in the Northwest Territories, “down south” usually means Alberta and the other Canadian provinces) Some Hallowe’en nights in Toronto have been so warm that the children were in shorts, but I was told that in Yellowknife there’s guaranteed to be snow on the ground by Hallowe’en. Right on schedule, Mother Nature has delivered the white stuff, with days to spare. The trees turned from green to yellow to a snow-laden white. There are no red Fall colours because there are no maples; it’s mostly conifers. 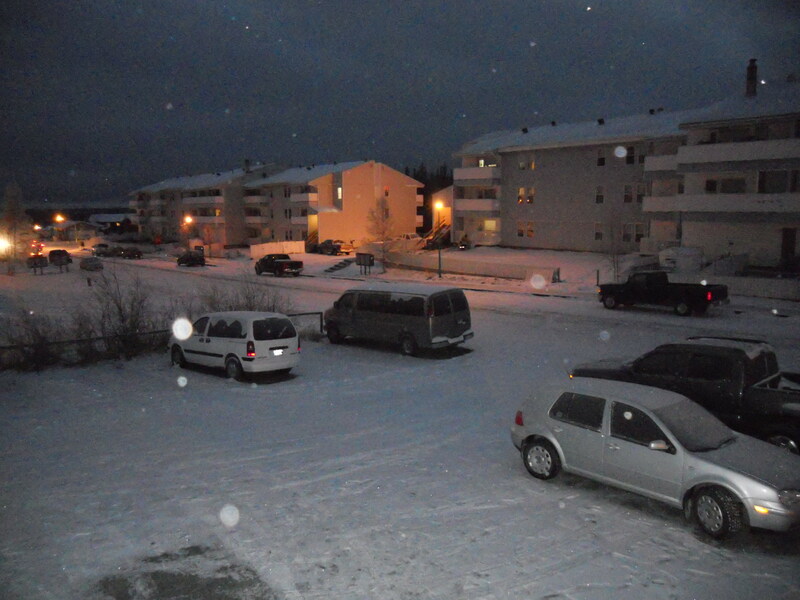 But unlike the heavy, wet snow of Toronto, Yellowknife snow is dry and feather-like. However, it’s still snow, which means that after the glorious summer of endless sunshine, we can no longer fool ourselves that winter won’t arrive. Even the sun becomes disillusioned: at this time of year it drags itself up around 9am, seems to fight its way from behind the leaden clouds, a battle that it frequently loses, then it wearily sets just before 6pm. We move the clocks back soon, so by December it will rise around 10am and set around 3pm. It still strikes me as very odd to drive by schools in Yellowknife and see the children running around the school-yard and on the jungle gyms and slides in the dark, fully engrossed in their games, completely unfazed by the darkness. Frankly, I think that I shouldn’t have to rise before the sun does, and that if my body were meant to be out in frigid weather I’d have been born with fur. The hibernating animals are the only sensible mammals up here. The change in expectation that is necessary to live here reveals itself even when you arrive at the airport. Years ago, to reduce my carry-on bulk when travelling, I used to take off my coat, stuff it into the outside pocket of my checked suitcase, and put it back on before leaving my destination airport. But one winter I was caught in a fire alarm at Gatwick airport, and I had to stand outdoors, shivering and incredulous, until the all-clear was announced. After that, needless to say, under no circumstance would I part with my coat when travelling in winter, even when going to warm climes. My first trip to Yellowknife was by air, in winter. I arrived at the airport and discovered that there was no insulated gangway connecting the aircraft to the terminal building. We had to exit the plane and walk outside – in minus 29°C – along the tarmac to the terminal. Without a coat I would have frozen to death, and while I was taken by surprise, thankfully I was prepared to deal with the cold. That established the tone for living here: you encounter things that may surprise you, sometimes horrify you, and you learn to be prepared to deal with whatever comes. Most of us barely give a second thought to municipal water and sewer connections. But here in the territorial capital, where there’s so much rock, there are many houses and buildings with no municipal plumbing connections. These buildings have water tanks, which must be replenished by truck-borne water supply, and likewise, there’s a service truck to pump out sewer tanks. You learn very quickly not to find yourself downwind of the sewer pump-out truck. Outside of the capital, just this September, the school in the hamlet of Colville Lake acquired toilets and running water…after 9 years. The children had been making do with a 5-gallon honey bucket (the ultimate euphemism) for a toilet, and hand sanitizer and baby wipes. Residents of provincial capitals and other big cities down south are accustomed to having a selection of malls, shopping plazas and outlets to buy all kinds of goods. In Toronto, within 20 minutes max, I could walk or drive to 3 major malls, 3 health food stores, 3 grocery stores, 4 drug stores, and numerous neighbourhood boutiques. In Yellowknife, the word “mall’ is used very loosely. There are 2 Extra Foods and a local Co-Operative for grocery stores, a Shoppers Drug Mart and the local Sutherland’s Drugs, 2 sporting goods stores, and some familiar chain stores: Canadian Tire, Home Hardware Building Centre, The Brick for furniture, Reitmans and Mark’s Work Wearhouse for casual clothing, Staples for office supplies, The Source for electronics. There’s also Roy’s, a local electronics store, and some clothing boutiques: about four selling women’s clothing and one for men. 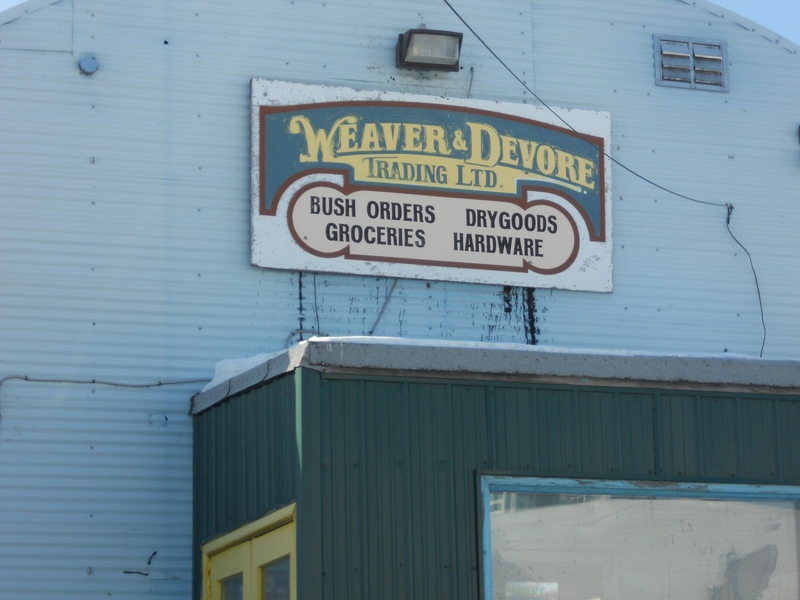 For almost everything else, there’s Wal-Mart, not to mention Weaver and Devore, a Yellowknife institution: a quaint, old-fashioned general store, where you can squeeze through the narrow aisles and find everything from hunting knives to coats to candy. Wal-Mart is a goldmine for residents of smaller communities. It’s quite common to see people exiting with 2 and 3 carts stuffed with goods, and loading up the truck for the drive back home. The Canada cost of living stats don’t seem to apply up here. Food costs are definitely higher in Yellowknife than down south, but it’s even higher farther north, where food security can be an issue. People live on a mix of country food, i.e. fish and wildlife, and basic foods from the grocery store. The cost of living index Canada looks manageable for most of the country, where transportation options make access to food relatively easy. The federal government subsidizes the cost of food in remote northern communities, which is only way that some residents can afford proper nutrition. Still, even the simplest diet can be expensive: 4 litres of milk can cost $13, a 5kg bag of flour can run to $33 and a head of cabbage can set you back $20. According to the HungerCount 2012 report by Food Banks Canada, the demand for food banks across Canada has risen 31% from 2008 to 2012. But in the territories, demand is up 72% over the same period. The price of gas is another story. In Toronto, announcements are made on the radio when the price is going up at midnight, to allow people to fill up beforehand and save a whopping couple of bucks. I used to be amused at the interviews on the Toronto 6 o’clock news, of motorists who were usually throwing their hands up in frustration and complaining that the government should be doing something to reduce the gas price, as they filled up their gas-guzzling SUVs. 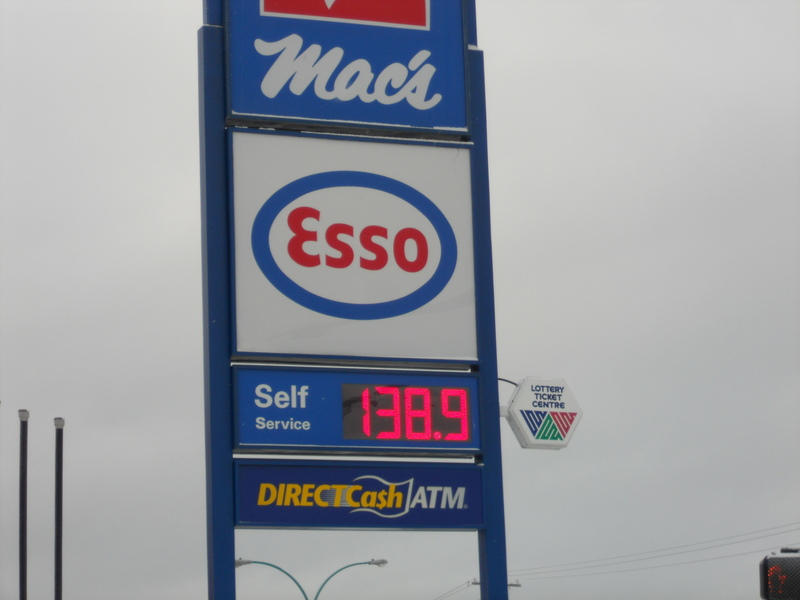 In the year+ that I’ve been in Yellowknife, the price of gas has not budged from $1.389/litre, which makes Toronto prices seem like a joke. Here, where there’s a high proportion of gas-guzzling Jeeps, SUVs and big pick-up trucks, nobody bats an eyelid. 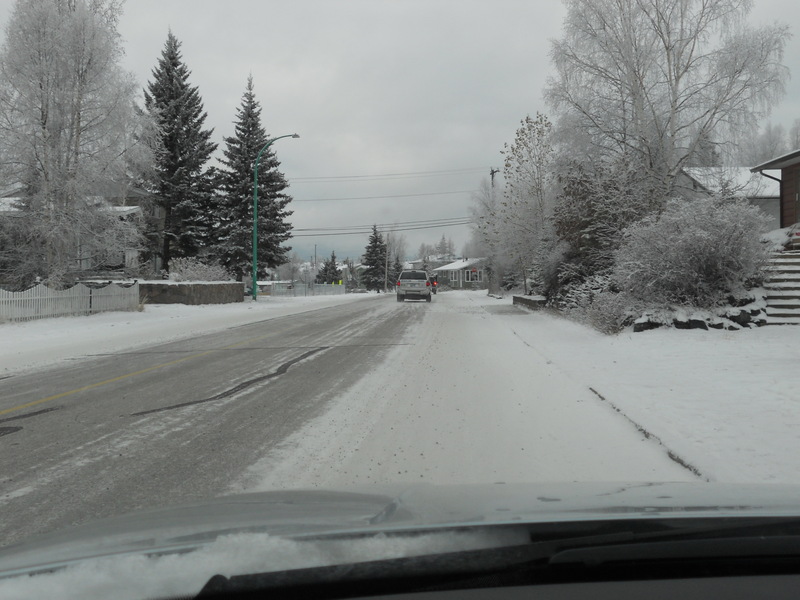 On top of that, during the depths of winter, people frequently leave their vehicles idling while they go grocery-shopping, not exactly a 2-minute task. While it’s understandable that things will cost more due to transportation, there is also a fair bit of price gouging here in the Wild West. After all, it’s not as if there are 10 stores selling the same thing and you can walk across the street and get it cheaper. I first experienced this while indulging an urge for potato chips at one of the local convenience stores. I was charged a price that was so much more than the one printed on the bag that I was positive the cashier had made a mistake. When I asked her why the difference, she looked at me as if I had 2 heads, waved dismissively and said “Oh that’s just a suggested price. We don’t bother with that!” Even the simplest things can be priced at a premium, so you learn to postpone your gratification and shop online – and to buy your chips at Shoppers and the gas station, where they’re better at following suggestions. Before I moved here, I asked a couple of people what it was like to live here. One assured me not to worry, that I would have everything I really needed in Yellowknife. What wasn’t said was that some of it would have to be obtained online. But in essence the advice was correct, thanks to Canada Post. Given the gigantic land mass that it serves, Canada Post rates are usually reasonable and the postal service is remarkably reliable and efficient. Even when I was in Toronto, I would receive mail that wasn’t properly addressed. Sometimes the postal code was missing, at other times the street name was incorrect, but it got to me anyway. Perhaps it was easy because there aren’t many people in Canada with my name, if any. But even so, it’s commendable, given the millions of pieces of mail that pass through the system. Some suppliers in the US have told me that they will ship to Canada, but not to the Northwest Territories. They act as if it’s not a part of Canada and there’s no mail service up here. I’m willing to bet that the residents of northern Canada are responsible for a disproportionately high percentage of package revenue at Canada Post, and we are collectively keeping the organization afloat. It takes about 4 days for a package to get here from Toronto. There seems to be a black hole between Edmonton and Yellowknife, as every time I check on a package, the tracking information stops at Edmonton. Just when I forget about it, the doorbell will ring and there it will be. Now I know that packages will arrive here 2 days after they’re updated in Edmonton. In Yellowknife, package delivery to residential addresses is done after working hours, up to 10pm, by contractors hired by Canada Post. This is eminently more sensible than in Toronto, where so much time is wasted attempting delivery when 90% of people are unlikely to be at home. In true Yellowknife fashion, the delivery man knows me now, so if I happen to be running out the door as I see him driving up, I can ask him if he’s got the package I’m expecting and he can tell me without having to ask my name. If I do have to collect a parcel, there isn’t much guesswork to be done, because there are only 2 Canada Post locations in Yellowknife, the main post office and a satellite in Shoppers Drug Mart. In smaller communities there is only one, which can sometimes be troublesome to staff. Not all deliveries are predictable or reliable, however. The northern version of the Bermuda Triangle is a place called Rankin Inlet, in Nunavut. It’s a connection point for many northern flights, and somehow, packages simply seem to disappear there. No matter how often you call to enquire and provide tracking numbers, nobody seems to know where your package is. The only thing that’s for sure is that it’s either going to miraculously show up at the destination eventually…or it might not. Airport security up here is so laid back that it’s practically falling down, and people are accustomed to helping each other out, even strangers. So if you have something small that absolutely must get to its destination on the next flight, it’s quite normal to just go to the airport and ask somebody to stick it in their hand luggage and take it for you. Travelling in the north is very different indeed. Down south, I dealt with mostly English, sometimes French. The Northwest Territories also has English and French as official languages, as well as the languages of the First Nations people who have lived here forever. In total, there are 11 official languages here, more than any other jurisdiction in Canada. 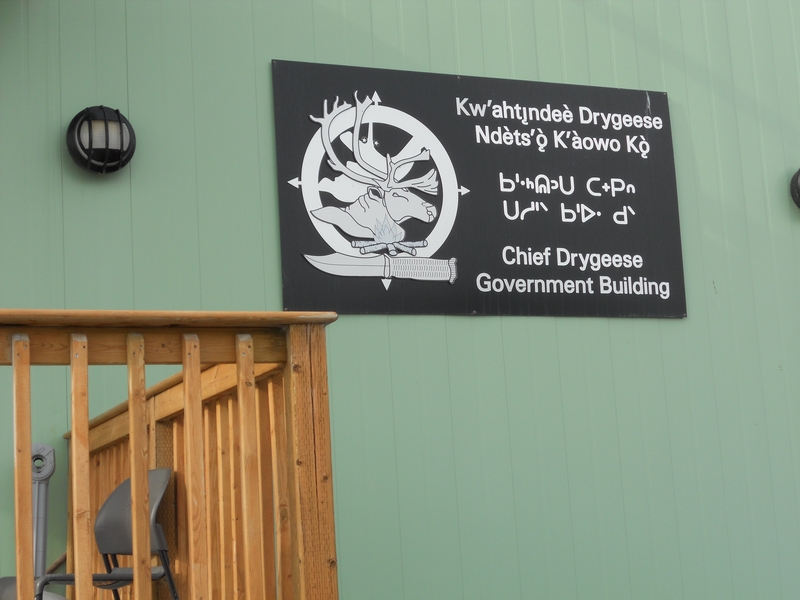 I’ve seen multi-lingual signs around town, and it’s not unusual to tune into CBC North radio and hear someone speaking in one of the aboriginal languages. I was never exposed to any of them before, so I have no clue what they’re saying. In written form, some of them are in characters, so I can’t even guess at reading them either. It all serves as a reminder that there were many people and languages here long before there were English or French – not to mention us more recent immigrants from all over – and adds to the appeal of living up here, the “real Canada” in some ways. In the time that I’ve lived in Yellowknife, I have altered my lifestyle and my expectations: I cut my own hair; I wash my car at the do-it-yourself carwash, (the only option in town, unless you want to go to the fancy detailing place); I shrug at power outages and light my candles; there’s no health food store that I can pop over to, but I know some good ones online; I have to wait days for purchases to arrive, so I am more patient; I can no longer choose from restaurants with cuisine from everywhere in the world, so I eat out less; there’s no boardwalk or path to go strolling or rollerblading for miles along the shore of the Great Slave Lake, but I can get a workout on the somewhat rugged 9km trail around Frame Lake; there’s no dessert store where I can sit on a patio and people-watch while enjoying something sinfully sweet, so I enjoy frozen yoghurt from the grocery store instead. Life in the north does not hold a lot of the things that I took for granted down south (I would kill for a good gelato), but as I was told, I have everything that I really need.